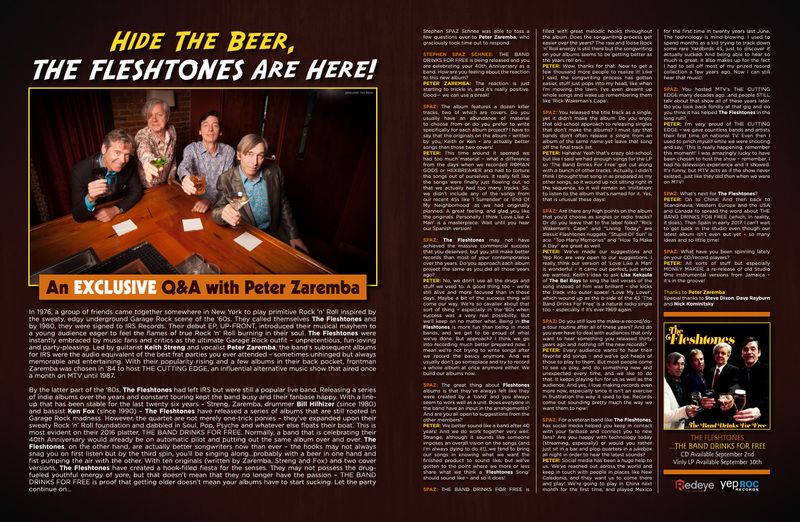 Discussions Magazine Music Blog: THE FLESHTONES: An EXCLUSIVE Q&A with PETER ZAREMBA! 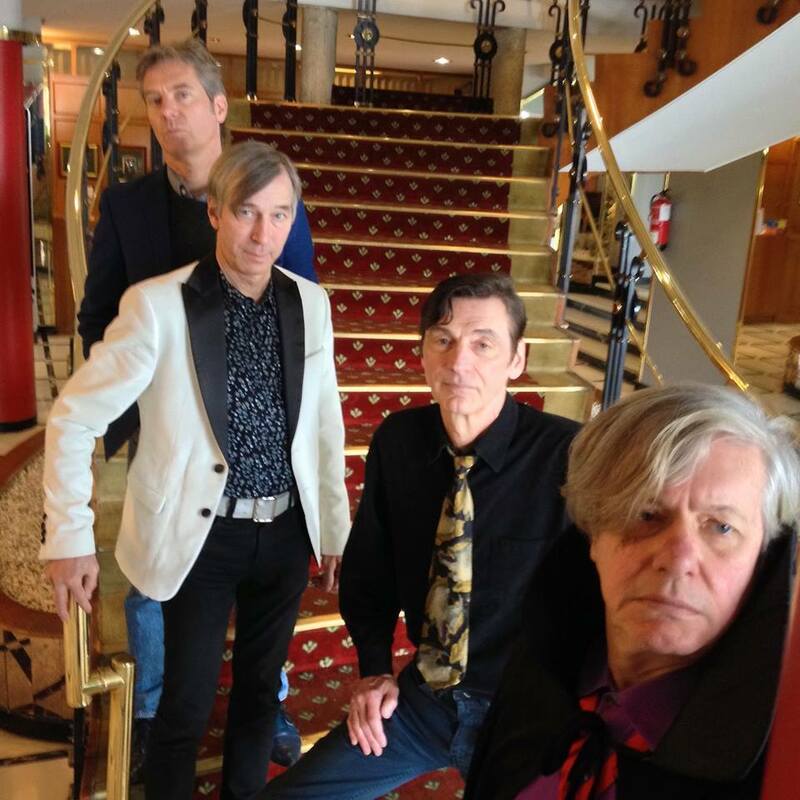 THE FLESHTONES: An EXCLUSIVE Q&A with PETER ZAREMBA! In 1976, a group of friends came together somewhere in New York to play primitive Rock ‘n’ Roll inspired by the sweaty, edgy underground Garage Rock scene of the ‘60s. They called themselves The Fleshtones and by 1980, they were signed to IRS Records. Their debut EP, UP-FRONT, introduced their musical mayhem to a young audience eager to feel the flames of true Rock ‘n’ Roll burning in their soul. The Fleshtones were instantly embraced by music fans and critics as the ultimate Garage Rock outfit – unpretentious, fun-loving and party-pleasing. Led by guitarist Keith Streng and vocalist Peter Zaremba, the band’s subsequent albums for IRS were the audio equivalent of the best frat parties you ever attended – sometimes unhinged but always memorable and entertaining. With their popularity rising and a few albums in their back pocket, frontman Zaremba was chosen in ‘84 to host THE CUTTING EDGE, an influential alternative music show that aired once a month on MTV until 1987. Stephen SPAZ Schnee was able to toss a few questions over to Peter Zaremba, who graciously took time out to respond. STEPHEN SPAZ SCHNEE: THE BAND DRINKS FOR FREE is being released and you are celebrating your 40th Anniversary as a band. How are you feeling about the reaction to this new album? PETER ZAREMBA: The reaction is just starting to trickle in, and it's really positive. Good— we can use a break! SPAZ: The album features a dozen killer tracks, two of which are covers. Do you usually have an abundance of material to choose from or do you prefer to write specifically for each album project? I have to say that the originals on the album – written by you, Keith or Ken – are actually better songs than those two covers! PETER: This time around it seemed we had too much material – what a difference from the days when we recorded ROMAN GODS or HEXBREAKER and had to torture the songs out of ourselves. It really felt like the songs were finally just flowing out, so that we actually had too many tracks. So, we didn't include any of the songs from our recent 45s like 'I Surrender' or 'End Of My Neighborhood' as we had originally planned. A great feeling, and glad you like the originals. Personally I think 'Love Like A Man' is a masterpiece. Wait until you hear our Spanish version! SPAZ: The Fleshtones may not have achieved the massive commercial success that you deserved, but you still make better records than most of your contemporaries over the years. Do you approach each album project the same as you did all those years ago? PETER: No, we don't use all the drugs and stuff we used to. A good thing too – we're still alive and more focused than in those days. Maybe a bit of the success thing will come our way. We’re so cavalier about that sort of thing – especially in the ‘80s when success was a very real possibility. But we'll keep on no matter what. Being in the Fleshtones is more fun than being in most bands, and we get to be proud of what we've done. But approach? I think we go into recording much better prepared now. I mean we're not trying to write songs after we record the basics anymore. And we usually don't go someplace and try to record a whole album at once anymore either. We build our albums now. SPAZ: The great thing about Fleshtones albums is that they’ve always felt like they were created by a ‘band’ and you always seem to work well as a unit. Does everyone in the band have an input in the arrangements? And are you all open to suggestions from the other members? PETER: We better sound like a band after 40 years! And we do work together very well. Strange, although it sounds like someone imposes an overall vision on the songs (and I'm always dying to do it! 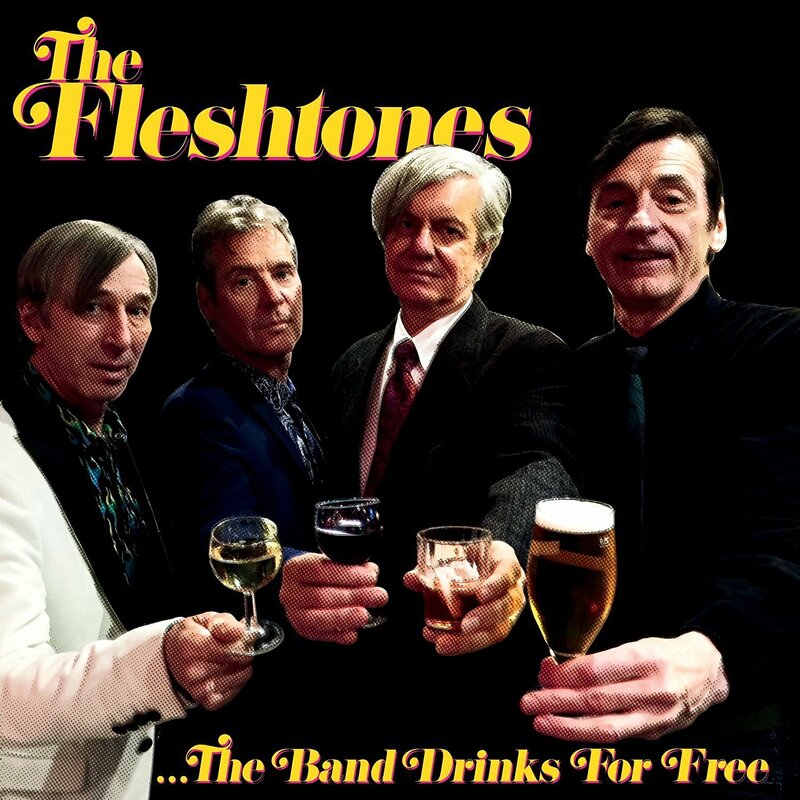 ), we tend to bring our songs in knowing what we want the finished product to sound like, but we've gotten to the point where we more or less share what we think a 'Fleshtones Song' should sound like – and so it does! PETER: Wow, thanks for that. Now to get a few thousand more people to realize it! Like I said, the songwriting process has gotten easier, stuff just pops into my head, like when I'm mowing the lawn. I've even dreamt up whole songs and wake up remembering them like 'Rick Wakeman's Cape'. SPAZ: You released the title track as a single, yet it didn’t make the album. Do you enjoy that old-school approach to releasing singles that don’t make the albums? I must say that bands don’t often release a single from an album of the same name yet leave that song off the final track list. PETER: Hahaha! Yeah that's crazy old-school, but like I said we had enough songs for the LP so 'The Band Drinks For Free' got cut along with a bunch of other tracks. Actually, I didn't think I brought that song in as prepared as my other songs, so it wound up not sitting right in the sequence, so it will remain an 'invitation' to listen to the album that’s named for it. Yes, that is unusual these days! Day” are great as well. PETER: We've made our suggestions and Yep Roc are very open to our suggestions. I really think our version of 'Love Like A Man' is wonderful – it came out perfect, just what we wanted. Keith's idea to ask Lisa Kekaula of The Bel Rays to sing the last verses of the song instead of him was brilliant – she kicks the track into outer space! 'Love My Lover', which wound up as the b-side of the 45 'The Band Drinks For Free' is a natural radio single too – especially if it's ever 1969 again. SPAZ: Do you still love the make-a-record/do-a-tour routine after all of these years? And do you ever have to deal with audiences that only want to hear something you released thirty years ago and nothing off the new records? PETER: Every audience wants to hear their favorite old songs – and we've got heaps of those to play to them. But most people come to see us play, and do something new and unexpected every time, and we like to do that. It keeps playing fun for us as well as the audience. And yes, I love making records even more now, especially since it isn't an exercise in frustration the way it used to be. Records come out sounding pretty much the way we want them to now! SPAZ: For a veteran band like The Fleshtones, has social media helped you keep in contact with your fanbase and connect you to new fans? Are you happy with technology today (streaming, especially) or would you rather just sit in a bar and plop quarters in a jukebox all night in order to hear the latest sounds? PETER: Social media has been a huge help to us. We've reached out across the world and keep in touch with people in places like New Caledonia, and they want us to come there and play! We're going to play in China next month for the first time, and played Mexico for the first time in twenty years last June. The technology is mind-blowing. I used to spend months as a kid trying to track down some rare Yardbirds 45, just to discover it actually sucked. And being able to hear so much is great. It also makes up for the fact I had to sell off most of my prized record collection a few years ago. Now I can still hear that music! SPAZ: You hosted MTV’s THE CUTTING EDGE many decades ago…and people STILL talk about that show all of these years later. Do you look back fondly at that gig and do you think it has helped The Fleshtones in the long run? PETER: I'm very proud of THE CUTTING EDGE – we gave countless bands and artists their first time on national TV. Even then I used to pinch myself while we were shooting and say, 'This is really happening, remember this moment!' I was amazingly lucky to have been chosen to host the show – remember, I had no television experience and it showed. It's funny, but MTV acts as if the show never existed…just like they did then when we were on MTV! SPAZ: What’s next for The Fleshtones? PETER: On to China! And then back to Scandinavia, Western Europe and the USA and Canada to spread the word about THE BAND DRINKS FOR FREE (which, in reality, it does). Then Spain in early 2017. I can't wait to get back in the studio even though our latest album isn't even out yet – so many ideas and so little time! SPAZ: What have you been spinning lately on your CD/record players? PETER: All sorts of stuff but especially MONEY MAKER, a re-release of old Studio One instrumental versions from Jamaica – it's in the groove! Great interview with one of the best songwriters & frontmen of all time, the always awesome Peter Zaremba!! The Fleshtones are my very fave band of all time and the best live band EVER. I really enjoyed reading this, thanks for writing it :D Count me in as a regular reader now too.